I had a spurt of energy this week and decided to do some Christmas baking! Peppermint Snowballs from Epicure, Butterscotch chip sandies from Taste of Home, which I substituted butterscotch chips for the pecans (since I forgot to pick them up!) & Cookie Jar Gingersnaps from Taste of Home. I packaged up one of each cookie into a cute container from Dollarama for Amie's sports class teachers as a little Thank You for the last day. Linked to Friday Link Party at Creation Corner, Simply Link Party at Simply Designing, & Show & Tell Friday at My Romantic Home. The baby room is ready, counting down to less than 2 1/2 weeks now! Since we had gotten rid of all of our baby stuff after Amie we started from scratch for baby Erica. Of course we made some thrifty spending choices, and were fortunate enough to know some friends getting rid of baby stuff too! Curtains from Walmart, recycled rocker and side table from other parts of the house, toys donated from big sis Amie, Martha Stewart shelf and pink fabric drawers from Rona. 3 drawer Ikea dresser from Kijiji, which we attached a change pad to, decals from Dollarama!, change pad cover from second hand children's shop. Bear from big sis Stephanie, wooden box from Michaels painted by Amie & mom. Love this cute pic - it was a vintage picture from a CD/book I got from Chapters a while ago, but you can get lots of vintage images from Graphics Fairy too. I printed it at Black's photo and popped it into a Dollarama frame! Hope you enjoyed the tour of the new baby room. Now it's just a waiting game! Over at Catch the Bug Challenge Blog the challenge for December 1st is to create a card with a tree on it, in the spirit of 'a partridge in a pear tree'! 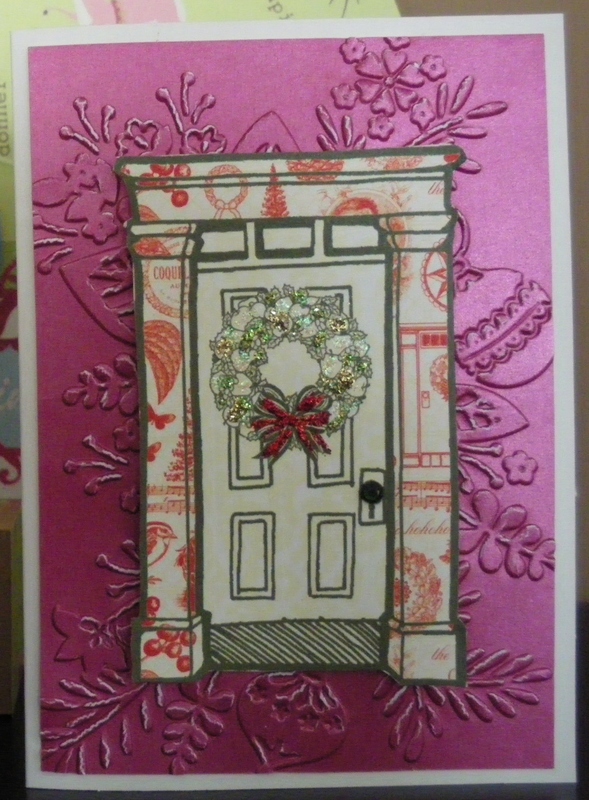 Lucky me I just created a very cute Christmas card using one of their digital stamps, Old World Santa! I colored this guy in with Prismacolor markers and then used Liquid Applique to fill in the beard and add some snow below Santa and on the tree. I used Stickles to add some sparkle around his robe and attached some gems on the tree. I was really pleased how this guy turned out! I mounted him on a piece of black cardstock and then used foam dots to mount onto sparkly green cardstock. Wow, another week gone by! Can't believe it's December already. Well, I'm well on my way to being completely ready for Christmas (and baby)! I found these awesome tags at Momomushy which you can print in color or black and white. I printed these in B&W on cardstock and colored them with Prismacolor markers. I love the online subscription of Crochet World Magazine, which I can access from my PC or I-Pad! This 'Chunky Speckled Neck Warmer' is a super easy pattern in the December 2011 issue - just 45 double crochets in 9-13 rows done in a 6 - bulky yarn with a size 10 hook. The starting chain really has to be done as loose as possible. I wanted a cute tag I could attach to the top of the neck warmers, so I used this digital penguin stamp I had previously downloaded and opened it in Microsoft Word, added my own font underneath and put 4 on a page of cardstock to print out and color. I then cut them in rectangles and punched a hole to add a ribbon in the corner. Of course, Christmas cards! This cute snowman is a digital stamp from Hero Arts that I downloaded from Two Peas in a Bucket and layered on sparkly pink cardstock, which I embossed. The scarf is a separate stamp (included) and layered over top the snowman with foam dots. I colored this little guy with Prismacolor colored pencils using a great tutorial on colored pencils. 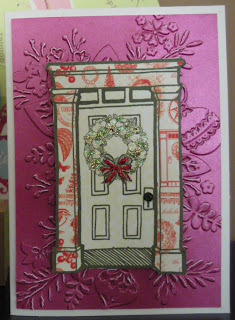 These cards were made with a cute 12x12 cardstock of doors, which I cut out and embellished with Stickles and popped up with foam dots over embossed cardstock. On some I added ribbon and stamped a sentiment. Shared with - http://creationcorner.blogspot.com/, http://www.simplydesigning.blogspot.com/, and http://romantichome.blogspot.com/.